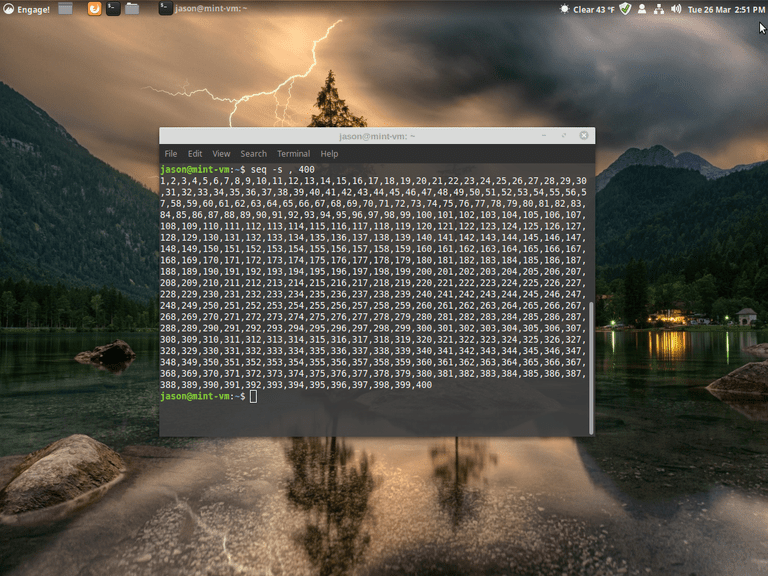 The Linux command Seq prints a sequence of numbers. It's a seemingly simple command that serves several useful purposes. It's a basic shell program that's standard in Linux regardless of your distribution. The optional arguments last, first, and increment specify the last number of the sequence, the first number of the sequence, and the value by which the sequence increments. By default, both first and increment default to 1. Seq parses the optional number arguments in the following order: last, first, increment, even though the attributes don't appear that way when you input the command. Thus, specifying a single numeric argument stipulates the final number in the sequence; specifying two numbers stipulates the beginning and the ending numbers with a default sequence of 1. The number formats follow the printf convention. Thus, %e is a double number in standard decimal form, %f is is a double number in fixed-point notation, and %g is a double number in standard or exponential notation, contextual to the magnitude of the number. Use the options to customize the output. To use a space as a part of a separator, enclose the entire string in double quotes.